the long interval on the question of the nature of gravity between Newton and Einstein. Sometimes delays in science are not what they seem. Take a butterfly: the chrysalis may seem inert, but there is a tremendous amount of cellular reconstruction going on to turn a caterpillar into a butterfly. A prime example of such a “pupation” is apparent in the gap quoted above. Certainly one can’t say that nothing was happening in that interval. Over the centuries, there had been a tremendous development of mathematics, and Einstein himself had come up with Special Relativity in 1905. Popular accounts often give the impression that what forced the hand was the Michelson-Morley experiment, which failed to detect any change in the observed speed of light as the Earth went this way and that in its annual orbit. However, it was not M&M (Eminem? ), but James Clark Maxwell who played the first ace, with his electromagnetic theory of light. Newton had advanced the corpuscular theory of light, considering it to be made up of little particles, whereas his contemporary Cristiaan Huygens (1629 – 1695) advanced the wave theory. Although Huygens’ theory could account for polarization, Newton’s theory won the day, or rather the century, and it was only with the observation of interference by Thomas Young (1773 –1829) that the wave theory came back and the tables were turned. The wave nature of light was further developed by the three French F’s, Fresnel (1788 – 1827), Fizeau (1819 – 1896), and Foucault (1819 – 1868), and formed the basis for the work of James Clark Maxwell. His equations demanded that the speed of light had to be always the same, whether it is relative to you shining a beam in my direction, or to me travelling towards or away from you, and receiving that beam. Newton’s cosmology was based on a concept of unique simultaneous time throughout the universe, and only by doing away with this could mechanics and electromagnetism be reconciled. If one regards it as a competition between these two, it was Maxwell rather than Newton who won the tug-of-war. Interestingly, in the same year, Einstein explained the photoelectric effect in terms of light quanta or photons (which won him the Nobel Prize) leading on to our present view of the wave-particle duality of light. From the statements made by the noble Shaykh, it is clear that he believes in Ptolemy’s words in everything he says, without relying on a demonstration or calling on a proof, but by pure imitation (taqlîd); that is how experts in the prophetic tradition have faith in Prophets, may the blessing of God be upon them. But it is not the way that mathematicians have faith in specialists in the demonstrative sciences. And I have taken note that it gives him (i.e. noble Shaykh) pain that I have contradicted Ptolemy, and that he finds it distasteful; his statements suggest that error is foreign to Ptolemy. Now there are many errors in Ptolemy, in many passages in his books. Among others, what he says in the Almagest: if one examines it carefully one finds many contradictions. He (i.e. Ptolemy) has indeed laid down principles for the models he considers, then he proposes models for the motions that are contrary to the principles he has laid down. And this not only in one place but in many passages. If he (i.e. noble Shaykh) wishes me to specify them and point them out, I shall do so. This work was given further mathematical development by the Persian Nasir al-Din al-Tusi (1201 - 1274), who invented the geometrical device called the Tusi Couple (which could be regarded as the first foreshadowing of Fourier analysis). 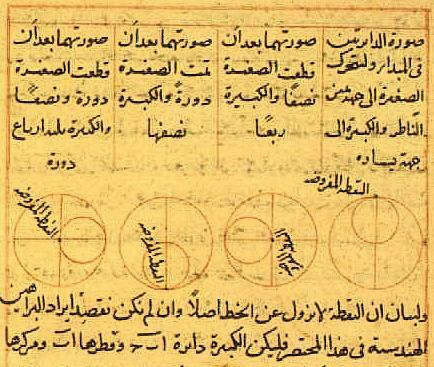 In a recent television series physicist Jim Al-Khalili showed a diagram in De Revolutionibus by Copernicus which corresponds to one in a manuscript of Al-Tusi, even using Roman letters corresponding to the Arabic ones of the earlier diagram. Now I am not accusing Copernicus of plagiarism, simply that others had lit the fuse to the bomb with which he exploded the Ptolemaic system. But particle physics is a bit stuck at the moment. A colleague tells me that that the Standard Model requires an input of 20 parameters in order to make it work. This looks to me as if it is has now become a bit “epicyclic” in character, and may be due for a “Copernican” overhaul. As for the quantum, now that’s a much more complicated story.